Cranach Lucas Senior German painter and a bright representative of the Renaissance. He had an individual unique style. He painted the artist, both pictorial and graphic portraits. His works had biblical undertones, despite the fact that usually deeply embedded meaning, looking at the portrait, is very difficult to recognize. 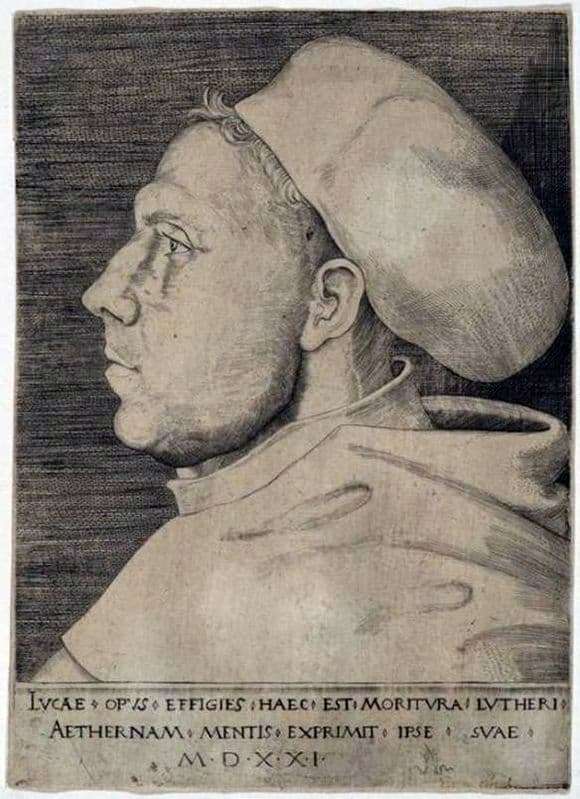 Cranach wrote a lot of portraits of his friend Martin Luther. One of such famous works is the graphic portrait “Luther”. The picture shows the profile of a young man. Although it is difficult to disassemble the clothes of a man, but it is safe to assume that this is a monk’s robe. Modern clothing of monks is somewhat different from the clothing depicted in the picture. The portrait was painted in difficult times for the Protestants, they were persecuted, the danger of life lay in wait for every believer. In the eyes of Luther, you can read the deep sadness. Although the man is focused, he is thinking about something, his lips are tightly compressed. The portrait exudes tension, but the expression on the face is peaceful. Muscles of the cheekbones are tense and this indicates the hero’s stiffness. He may be tired of posing, but, most likely, he is immersed in his thoughts, which are far from writing portraits and from the real world.